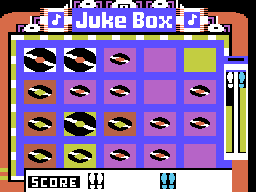 JUKEBOX is a musical strategy game that's kind of a cross between a chess match and a dance contest. 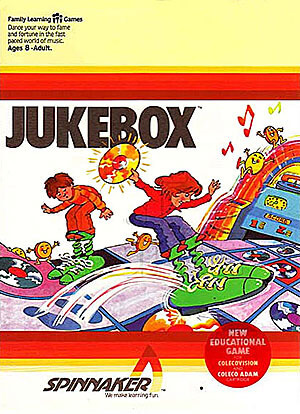 During the game the jukebox plays lots of terrific songs—songs so good you never want them to stop. But to keep the music playing. you've got to create gold records. Use your dancing shoes to jump from square to square. creating hit records as you go. The more gold records you get, the more coins you earn. 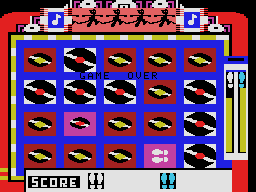 Use the coins to keep the music bopping and the game from stowing. 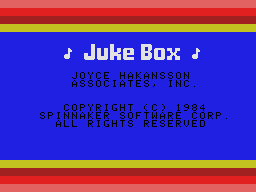 And not only is JUKEBOX fun to play. it's also a challenging learning game. By studying the size and configuration of records. players develop strategies to avoid being trapped. Memory and concentration skills are tested as players plan their moves from square to square. And by recognizing patterns. players sharpen their prediction skills. All together. 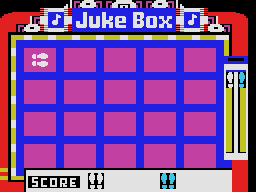 JUKEBOX is an exciting challenge with plenty of fun for young and old alike.